A disabled ex-Army officer turned world-class cryptographer...a beautiful FBI agent...and a ruthless murderer on the loose in Atlanta. A heartless killer ambushes and guns down ex-mobster Jay Mancini. Days later, the killer disposes of Mancini’s live-in girlfriend in cold blood. Desperate to identify the culprit, Jay’s niece Chelsea convinces work colleague and amateur detective Alton Blackwell to help investigate the seemingly run-of-the-mill professional mob hits. Alton and his girlfriend, FBI Agent Mallory Wilson, race to sequester Chelsea away from wrathful mob gangsters intent on silencing anyone with knowledge of “family activities.” But the investigation spirals out of control as a series of new events with no apparent mob connection serves to confound their efforts to identify the assassin. As Alton and Mallory struggle to make sense of scant evidence, unseen danger marches inexorably closer to them and Chelsea, who seems to lie in the vortex of the mayhem. Will Alton and Mallory unravel the mystery in time to avoid becoming the killer’s next victims? And will their growing relationship survive the presence of the beautiful Chelsea Mancini? 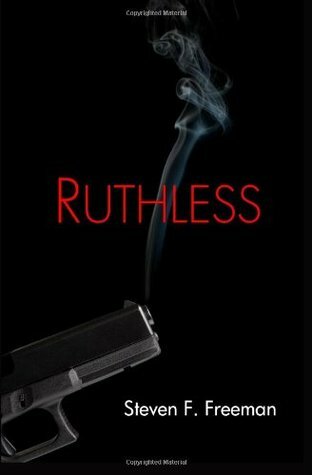 Combining edge-of-your-seat psychological thrills with a side of romance, RUTHLESS keeps readers guessing until the final clue is revealed. Ruthless is the second book in the Blackwell Files series. Thank you to Steve Freeman for the first time he asked me if I was interested in reviewing one of his books. That book was Tears of God, the seventh book in the Blackwell Files series. I loved the characters and his writing style in that book and the subsequent read, The Dig. I went back to the first book in the series to start at the beginning. So, after finishing Nefarious I got onto Ruthless. Neither book disappointed and I am eager to continue catching up with Alton and Mallory as well as David and Fahima in the next episode of their lives. I should say while I am now reading them in sequence it is not necessary, they do standalone quite well. Freeman includes just enough information if you haven’t read earlier books but does not bog down the reader who has. I love the characters. Alton and Mallory complement each other both in personality and skills for solving the crime. Their romance is slowly developing but not dominating the story. There is a little sub-mystery involving David and Fahima who met and fell in love in the first book. Will they be able to overcome red tape, so she can join him in the US? I enjoy Freeman’s writing because he gets straight into his story line without any unnecessary preamble. The momentum grows throughout until the final reveal. There are no dull or boring patches. There are plenty of twists and turns. I guessed the who but not how or why. I am eagerly looking forward to the next book in the series. Just the development of Alton and Mallory, as well as David and Fahima relationships, while knowing there will be another good read, will push me on. If you love reading mysteries/thrillers in a series don’t miss The Blackwell Files.